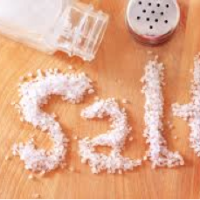 Most Americans unknowingly consume a great deal of poor quality, commercial salt in the form of snack foods, prepared foods, fast foods and restaurant fare. The salt used in these products is highly refined. You can think of it as the white sugar of the salt world. Common refined table salt looks like salt and tastes like salt. However, you are getting much more and much less than you bargain for. Let ‘s look at the difference between commercial refined salt and naturally harvested sea salt. Common table salt is mined and stripped of its naturally occurring trace minerals, which are then sold separately for profit as supplements. Magnesium is extracted by processing the original salt with caustic soda or lime, fetching a higher price. 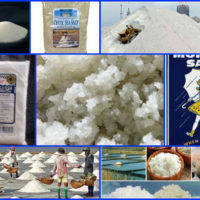 Other valuable elements in the sea salt are also lost or extracted. Some folks argue that the trace minerals are of such miniscule proportion that they are insignificant to human health. It’s true that we do not need huge amounts of copper, manganese, selenium, boron, etc., but our human biology is evolved to include this subtle but vast array of trace minerals to support cell metabolism. Natural sea salt contains 60 to 90 trace minerals. After stripping the salt from its naturally occurring minerals, commercial salt is heated at high temperatures and supplemented with iodine and various agents to make it free flowing. The most common free flowing agent is aluminum silicate. Aluminum concentrations have been found in the nerve dendrites of Alzheimer sufferers. Many people avoid aluminum cookware for this reason, but are not aware that they are consuming aluminum everyday in salt. Perusing salt cartons in the supermarket, I noticed another agent listed on the back of Morton’s Sea Salt and also on Morton’s Kosher salt: yellow sodium prussiate? Hmm, what is sodium prussiate? Sodium prussiate or sodium ferrocyanide (YPS or E535) is another free-flowing chemical agent industrially produced from hydrogen cyanide. It is added to road salt to keep it from clumping and a stabilizer for the coating on welding rods. In photography it is used for bleaching toning and fixing. According to the MSDS (Material Data Safety Sheet), it is a hazardous irritant to the skin, eyes and respiratory system. Advised in case of ingestion: Do not induce vomiting. Loosen tight clothing such as the collar, tie, belt or waistband. If the person is not breathing, perform mouth-to-mouth resuscitation and seek immediate medical attention. Obviously, the FDA must have approved a certain proportion of these anti-caking agents in food grade salt, but one must question the subtle long-term effects on human health, especially if an individual’s health is compromised. For me, I prefer the inconvenience of a few clumps in my salt box by the stove. I remember Cornellia Aihara advised folks to choose a clean, white naturally harvested sea salt over colored salts such as the gray or pink salt. She said the colored salts were too yang or contracting for humans: that these salts were OK for pickling or for animals. She never fully explained why. I questioned whether this was a “Cornellia-ism” or simply because she exalted Mr. Muramoto and the salt he produced. 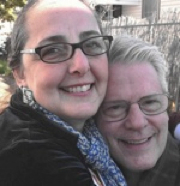 I know many camps highly promote the gray Celtic Sea Salt. So I called David Jackson, who processes and provides the brand, SI salt, available through Goldmine Natural Foods and is sold at various natural foods stores. His opinion agreed with Cornellia’s that the colored salts are more yang than the cleaner white salts and that he had observed that consumption of the colored salts over time produced some pretty yang folks. From a macrobiotic perspective (big view) perhaps the more mineral rich impurities in colored salt may benefit those whose condition is more yin or needing more minerals, perhaps for certain lengths of time. So use your informed judgment and select a quality, naturally harvested salt that appeals to your personal needs and biology. Number 1, choose a salt produced by natural elements of clean water, wind, sun and earth with minimal processing. Number 2, choose a salt free from chemical additives. 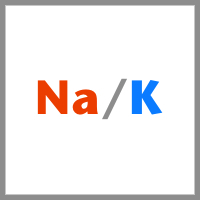 Ever since coming across the first mention of Dr. Ishizuka’s sodium and potassium (Na/K from now on) theory over 40 years ago, I have been on a mission to find out more. George Ohsawa based his macrobiotic theory on Ishizuka’s teachings. It was Ishizuka’s books on Na/K applied to food and health that first caught Ohsawa’s attention, and by following these teachings he was able to recover from serious illness. Over time, Ohsawa created his yin-yang interpretation of Ishizuka’s theory, and macrobiotics was born. In the process, unfortunately in my opinion, Ishizuka’s original Na/K theory faded from view. When the food we eat has an Na/K ratio closest to the Na/K of our body, we maintain good health. When we regularly consume foods that are way high or way low in their Na/K ratio, their potential for contributing to various health problems increases. There are physical and mental health conditions which are signs of regularly consuming foods with a low Na high K ratio. There are physical and mental health conditions that are signs of regularly consuming foods with a high Na low K ratio. 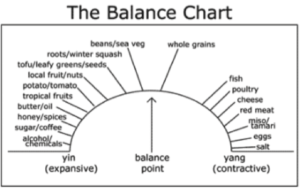 We can adjust the consumption of foods to restore balance to our body, by choosing food that have a more balanced Na/K ratio that is closer to that of our body. For an example of a food, let’s look at a banana. It’s Na/K ratio is 380:1. From Ishizuka’s viewpoint, banana, though it can certainly be enjoyed as a treat now and then, would not make a good primary and daily food for human consumption because its Na/K is way high in K. An opposite example is bacon. Bacon is extremely high in Na and low in K.
George Ohsawa categorized foods that are high in Na and low in K as “yang.” Foods that were high in K and low in Na he categorized as “yin.” There are other factors that can be used to determine the yang or yin of food, but Na/K ratio was a significant determining factor in Ohsawa’s view. Ishizuka’s theory offers us another tool for determining how to appreciate a food, not just for taste and satisfying hunger, but for healing as well. You’ve probably noticed: it’s become a very impatient world. 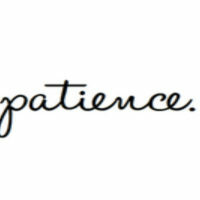 Individually and collectively, patience seems to be fading. On the road, in traffic, in stores, in relationships, in politics, international relations, finances, waiting in line, fast food, fast medicine, etc., lack of patience is expressed in many ways. There can be many explanations and opinions as to why this is so. I’d like to present one that is not commonly considered, if at all: we’ve become impatient at the physiological level; and very specifically we’ve become digestively impatient. The human digestive system has a very natural and gradual way for food to be digested, before it is absorbed into the blood and then assimilated by our cells. 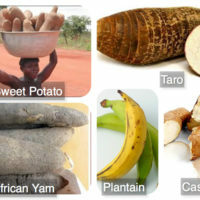 Let’s look at carbohydrate, for example. The way the body works is that carbohydrate digestion is supposed to begin in the mouth; that is, when the carbohydrate we are eating is the complex kind, polysaccharide. Complex carbohydrate is meant to be chewed, mixed with saliva, and through the action of the enzyme, salivary amylase, begins to be broken down to disaccharide, a simpler form of carbohydrate. If you’ve ever chewed brown rice really well, you noticed that it starts to taste sweet. You are tasting the complex carbohydrate in the brown rice being slowly converted to simpler carbohydrate, preparing it for the next stage of digestion. The body is smart. It likes to digest slowly and patiently. Next, the complex carbohydrate that has been chewed is swallowed and goes down to the stomach. No further digestion of the carbohydrate takes place in the stomach due to stomach acid that stops the action of the salivary amylase. The chewed carbohydrate moves from the stomach to the duodenum, the passageway between the stomach and small intestine, where is stimulates the secretion of pancreatic amylase from the pancreas, further breaking down the complex carbohydrate that wasn’t broken down through chewing. This disaccharide now enters the small intestine where the enzymes lactase, sucrase and maltase, break it down into monosaccharide, single sugars, that can then be absorbed through the small intestine and released into the blood. This is a gradual and natural process, relying on digestive patience. It’s how the body wants to digest carbohydrate, if given the chance to do it right. In today’s world the carbohydrate most widely consumed is not complex carbohydrate. 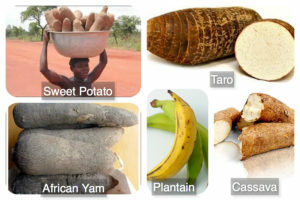 It is chemically processed simple-sugar carbohydrate such as white sugar, candy, high fructose corn syrup, and dextrose. Even many so-called natural sweeteners like agave syrup, maple syrup, coconut sugar, evaporated cane juice, and others, are highly processed into simpler and concentrated sugars. And honey, long-considered by many to be the favored natural sweetener, is 100% simple sugar, pre-digested by the bees. All simple sugar bypasses the body’s need for natural and gradual complex carbohydrate digestion, since it has already been reduced to its simplest form. It travels quickly through to be released into the bloodstream. This impatient, hurry-up digestion has become the norm, and over decades of modern eating, the body has become habituated to it, though it doesn’t respond well to it. It is well-known that many physical and mental health problems today have their roots in the over-consumption of simple sugar. One argument to this idea of “patient digestion” is that all sugar eventually ends up in the small intestine as simple sugar prior to absorption into the blood, and therefore it doesn’t matter if it started out as complex carbohydrate or manufactured simple sugar. But it’s the rapidity and the quantity of delivery of simple sugar to the blood that is the difference between consuming complex carbohydrate and processed simple sugar. And I would further clarify this by emphasizing “complex carbohydrate with its natural fiber intact,” such as whole grains, fresh vegetables, and beans, as the healthiest carbohydrate to for digestive patience and overall health. Also, when the simple sugar, fruit sugar or fructose, is consumed I suggest eating the whole fruit, with its fiber, rather than in the form of juices, concentrates, flavorings, syrups and powders. Fiber in food has long been proven to support natural digestive function (digestive patience). 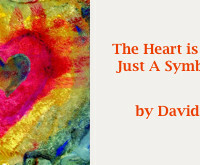 There is a saying, “Biology precedes psychology.” I would adapt it and say, “Physiology precedes psychology.” If we hurry up our digestive physiology, demanding that it work faster through the consumption of simple sugar of various kinds, we will see a reflection of that outward in all kinds of expressions of impatience. Outward behavior is influenced by what’s happening inwardly at the physiological level. 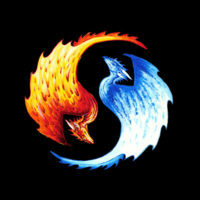 The two cannot be separated. Inevitably, all of the body’s internal organs are made to work harder by the modern diet of excess protein, fat and sugar, ultimately causing over-stimualtion of the metabolism and nervous system, giving further rise to personal and social impatience. Re-estalishing inward physiological and digestive patience, eating in a way that supports the body’s natural stability, we see outward patience being restored over time. Oroville, CA, where I live, claims fame as the home of the canned olive. When a woman named Mrs. Ehmann found herself widowed and penniless, she got busy and invented the canned olive, today commonly fitted as a joke by kids over their digits at the holiday table. The Mediterranean climate here in Oroville is perfectly suited to the growth of this illustrious fruit. There is even a town named Palermo nearby since it reminded the settlers of the Italian town. Olive trees abound here, as well as abandoned orchards that gradually succumb to housing projects and apartment complexes. Some survive the dozer and provide landscaping shade in schoolyards, parks, and around homes, as they require no water during the blazing hot summers. For most folks today, the fruits are a nuisance, staining their patios and sidewalks, but for me, they are a glorious treasure longing to be acknowledged and touched by human hands. 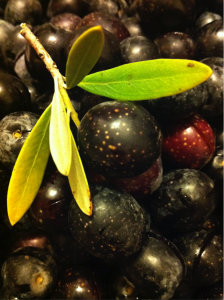 The late fall and winter months provide an abundance of ripe olives. The colors are a rich and vibrant deep purple, almost black. There may be a few in the mix that are maroon in color. Throw in a few olive leaves and the palette of color will make your heart sing. Combine the olive picking with a picnic, children, grandchildren or a dear companion, and the flavor of your home cured olives will be even more delicious. Salt cured olives are so incredibly simple to make that it causes one to wonder why more people don’t, especially when you view the price tag on naturally cured olives. Perhaps folks just accept Mrs. Ehmann’s version of the dark, canned olive as the only way to have an olive. Probably they have not yet tasted the rich, robust, complex flavor of salt cured olives, or experienced the contrast of cool earth seeping through the soles of your shoes, balanced by the warm sun knitting rays into the back of your sweater…or a blue sky floating cloud patterns above your head whenever you look up to reach a higher branch heavy with olives. Mix that with the sounds of children, flushing wings, birdsong and the rubbery firm sound of olives bouncing into a bucket after picking: authentically life-delicious! –Pick ripe olives from the tree. Resist the temptation to collect fallen olives from the ground as those are more susceptible to spoilage. –Sort through the olives and pick out any remaining stems and discard any olives that show signs of insect wounding. –Weigh the olives and write down the weight. -Cover the olives with water. Pour off any floating debris, rinse again and drain. –Weigh out the salt. You need an amount of salt that is ½ the weight of the olives. If you are doing a small amount of olives, it may be affordable to use your expensive natural sea salt. If processing a larger volume of olives, use pickling salt that has no additives or you can use inexpensive rock salt (we use this for salt baths). This unprocessed solar dried salt can be purchased at home improvement stores for $5-$6 per 35 lb. bag. You can use it in the rock form, but I like to put in in the blender and grind it up as it dissolves better during pickling. –Mix the olives and salt together. 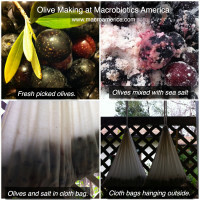 – Slip the olives into a cotton bag or old pillowcase. 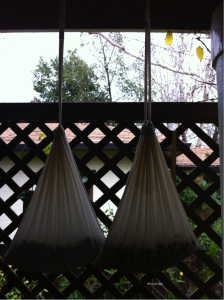 – Tie off the bag and hang either outside or inside. I have some hooks in the ceiling of my front porch or you can hang them inside a garage or other protected area. Keep in mind that the salt will pull dark liquid from the olives that can stain cement or walls. Be sure to put a bucket beneath the olives to catch this liquid. 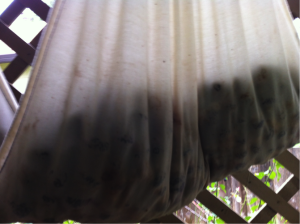 If you should hang the bag from a tree, keep in mind that the dark liquid is also very salty, which will kill plants. Some people say rain does not harm the olives, but if I hang them outside exposed to the elements, I make a rain jacket for them by cutting a corner from a plastic bag and slipping the rope through this small hole. –Cure for 4 to 6 weeks. Once or twice per week, mix the olives. Simply lift up on the bottom of the bag and gently mix by rolling the olives around inside the bag. After a month or so, taste the olives. When the flavor is to your liking, the olives are done. These olives will naturally have more of a bitter flavor, but the bitterness lessens with curing time. 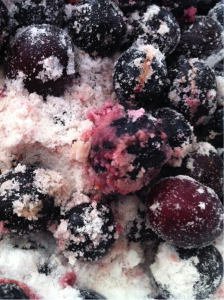 –Remove the olives from the bag and quickly rinse off excess salt. Drain well. Perhaps spreading out in a single layer may be a good idea if you are storing them long term. -These olives are delicious to me just like this, but usually I dress them with herbs and olive oil, and store them in jars in a cool place for 3-6 months. They will keep a year or longer in the fridge. – To dress the olives toss with enough organic olive oil to coat them. Fresh or dried herbs may be added such as rosemary, thyme, or oregano. I found that fresh garlic tends to grow mold, so if you like garlic add it to a smaller amount of olives and store in the refrigerator. I remember my first macrobiotic cooking class with Aveline Kushi. We drove from Kansas City to Chicago in our Hornet station wagon purchased for $150. Talk about trust in the Universe! The brakes gave out during rush hour traffic upon entering Chicago. Miraculously, we made it to the hotel ballroom where Aveline Kushi lightly floated behind butane-fueled cook stoves preparing a delicate blanched salad. I recall her words of wisdom as she blanched the whole stems of parsley. 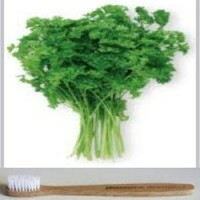 She advised us to include the stems because, “They are like little toothbrushes in the intestines.” The image her words invoked stuck with me, especially whenever I mince parsley! This was in the ‘80’s (post Wonder Bread generation), when fiber was recommended to moisten the stool, cleanse the intestinal villi and add bulk in order to move the stool along, thereby preventing constipation and avoiding diverticulitis. The gamut of IBD (Irritable Bowel Disease), such as Crohn’s, ulcerative colitis, gluten intolerance and other subsequent related inflammatory diseases were not yet common medical diagnoses. Oh, life gets more and more complex! It seems that generationally, diseases progressively compound to mirror our ever-increasingly refined dietary practices. Also, subsequent generations inherit the health conditions arising from the previous generation’s dietary patterns, both at the dinner table and through their genomes. Here’s the good news, though. Aveline Kushi’s words still ring true, as does the wisdom within a macrobiotic diet centered on whole grains, vegetables and legumes. Current science reveals much more than little fibrous toothbrushes scrubbing the lining of our intestines. While fiber was previously thought of as indigestible to humans, turns out to be an essential food for literally hundreds of commensal bacteria (helpful microbes) in our colon with outstanding implications to our health. Perhaps it is the microbes that are wielding teensy tiny little toothbrushes. Fiber is found exclusively in whole plant-based foods. You will not find a speck of fiber in flesh foods or dairy foods. Fiber provides a source of energy that plants can utilize, but fiber is virtually unaffected by the digestive enzymes of humans. Fiber travels all the way through the digestive tract intact until it reaches the colon. Most of the excess water and nutrients have already been extracted along the way. At the end of the line, we have colonies of specialized bacteria waiting for the “goodie wagon” to arrive so that they can have dinner. These bacteria thrive on fiber and are able to digest the complex carbohydrate locked within fiber and turn it a myriad of chemical substances and short chain fatty acids. One of the most notable of these by-products of microbial fiber digestion is butyrate. Butyrate repairs the gut mucosal lining so that toxic waste and pathogens do not leak through the intestinal wall and enter the blood stream. It keeps our heart healthy by removing plaque from our arteries. Butyrate acts as an epigenetic switch that serves a healthy immune system by stimulating the production of regulatory T-cells in the gut. By keeping these friendly microbes fed with plant fiber, we can avoid the cascade of autoimmune diseases such as atherosclerosis, rheumatoid arthritis, IBD, and diabetes to name just a few. An interesting experiment conducted by Tim Spector, Professor of epidemiology at King’s College in London illustrates the significance of fiber. He collaborated with his 23-year-old son who was working on his dissertation toward a college degree in genetics. His son ate only a fast food diet consisting of burgers, fries and Coke for ten consecutive days. As a special “treat” he could also break the burger monotony by sometimes substituting chicken nuggets in place of the burger. He was also allowed extra “nutrition” in the evening in the form of beer and chips. His microbial gut profile was carefully monitored and recorded through 3 different labs to ensure that the results were accurate. The lab results showed that in 10 days, he had lost over 1200 microbial species, a 40% reduction in microbial diversity. Spector stated that this experiment had changed he and his son’s perspective on why junk food is bad for us. Previously, they had thought that junk food is bad for you because of the sugar and high fat content. After the experiment, they concluded that the 10-day diet, lacking dietary fiber had literally starved off these helpful bacteria that need fiber to survive. So next time you are craving French fries, a burger or a soda, think of your colon friends and have mercy upon them. Cook up a yummy dinner with whole grain, veggies and beans. And when you are mincing parsley, remember Aveline Kushi’s wise words and think twice before tossing those stems into the compost. 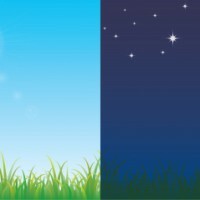 The morning, when we first wake up, and the evening right before we go to sleep, are unique times of our day. In the morning, we are just beginning our day, and in the evening we are coming to the end of our day. Both of these times offer us a special opportunity to do a self-review of our health and well-being, whereas during the day we may become too busy and end up missing valuable messages from the body and the mind. As soon as we wake up in the morning, we may receive a variety of messages from the body, but these messages often recede from our awareness, or disappear physically, after 20-30 minutes of being up and about. Paying attention to how we are feeling, and to signs and symptoms that may be present as soon as we get up, can give us helpful insight into the current state of our health. There can be many different reasons for these morning symptoms. The most common cause is the over-eating of acid-forming foods and drinks, especially late at night before sleeping. If a food is concentrated in protein, fat and/or simple sugar it is acid-forming in the body. This acid builds up in the fluid surrounding cells in the body, causing the cells to weaken, and as a result, organs and glands start to poorly function. Acid can also increase inflammation, pain, and general achiness. Increasing the consumption of plant foods that are alkaline-forming, while decreasing acid-forming foods and drinks can help over time. Most green vegetables are alkaline-forming in the body, as is vegetable soup seasoned with miso. Edible sea vegetables are off-the-chart alkaline supportive in the body. Whole yellow millet is a wonderful whole grain for giving alkaline support in the body. A varied plant-based macrobiotic diet is alkaline supportive overall. The evening, right as we are lying down for sleep, offers another self-review opportunity. Complementary to the morning time with its opportunity for reflecting on physical symptoms, the evening can offer an opportunity for emotional and personal happiness self-reflection. We often find ourselves thinking, after we turn the lights off, “How did my day go?” or “Did I do what I really wanted to do with my life today?” We may think back for a moment on our behavior, or the behavior of others toward us, and our responses to them during the day. We might anticipate tomorrow. It’s a moment where we can get a sense of how we feel about our life as it is currently going. I view one day as the concentrated version of one’s whole life. In the morning we are “born” into the day. It’s a brand new day like no other has been or will ever be again. In the evening, we “die” to the day. We must let it go. In between we live our day, and it gradually grows from its morning infancy to it pinnacle of youthfulness at noon, and then begins the natural process of declining into mid-afternoon, late-afternoon, early-evening, and finally nighttime. One day is the reflection of life itself. So, the morning, when we are born to the new day, and the evening when we die to the day, are wonderful opportunities to reflect on our life, physically, emotionally, etc. For example, if we find ourselves thinking every night before sleep, “I didn’t live my life like I really wanted to today,” and if we feel that way night after night, for years, it may be that at the end of our life we look back and think, “I didn’t live my whole life as I really had wanted to.” So, by taking a moment in the evening, before sleep, and reflecting on how we lived the day, may give us insight into changing and finding ways to live our days as we really want. This could have a profound impact on one’s whole life. Same thing if we find ourselves waking up in the morning and thinking, “Oh, no, I don’t really want to get up and go out into my day.” Of course, this might happen once in a while, but if it becomes the common thought morning after morning, something is calling for change. Our first thoughts upon awakening and our last thoughts before sleeping are wonderful messages to us if we listen. As you reflect upon your waking up time and before sleep time, may you find peace and health!